In this blog continuation we learn more about The Mikell Folk School, another organization founded by Bishop Allan that helps give people from all background the opportunity to learn a new craft they may never have thought about trying before. Highland Woodworking: How did the Mikell Folk School start? Frank Allan: In 2000 we thought “let’s try a Folk School at Camp Mikell!” During one weekend in our first year, we hauled all of the equipment in several vans from Emmaus House up to Camp Mikell in Toccoa, GA. We took it up on a Friday and then brought it back to Atlanta on Sunday evening so it was ready for Emmaus House to use the next morning. 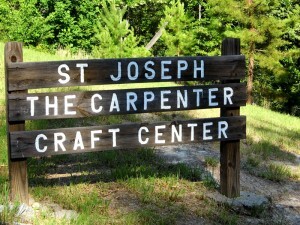 I decided after awhile it was sort of crazy to do the hauling back and forth, and thought “why not just have a full separate facility in Toccoa?” So we went out and raised money and we built the St. Joseph Craft Center up at Camp Mikell. Again, we got all of our equipment for this center from Highland Woodworking. At our Camp Mikell Folk School we offer Wood Turning, Pottery, Weaving, Photography, and Felting. We have a lot of people sign up for weaving and wood turning and they’re our most popular classes. We get a lot of volunteer teachers who have also been teachers at the John Campbell Folk School. We often bring up a full bus load of people from both Emmaus House and Holy Comforter for these Mikell Folk School sessions. We get a wide variety of people from all different backgrounds to come. A lot of fairly well-to-do people. A mixture of black and white, rich and poor. People who have mental disabilities, people who don’t. We all come together for one weekend, twice each year. Our Spring session is for about 120 people while our Autumn session is for about 50 people, and is a little more specialized with fewer offerings, which is why there are fewer people. We’ve recently started to offer copper enameling, and that is really popular. We didn’t have anybody to teach it, so Elizabeth, my wife, went off to Chastain and learned how to do it. Then a lot of artists came in to take it and they have become pros and they sell it online and in their shops. Our idea is for people to discover their own creative gifts and that they can do things. A lot of people say “Oh, I’m not an artist.” I can’t say that I am either, but they can make beautiful things and then they can sell them. Part of our aim is we are non-profit, and non-competitive – we’re not competing against any other groups. We’re the only Folk School in GA. One of these days we would like to expand the usage of the place to other groups and programs. HW: Is wood turning offered in both sessions? FA: Yes, we always do wood turning because that always fills up. We get some people who have never done wood turning before and they get really into it. They come home from the folk school and will often want to get their own lathe. Generally we work on the mini lathes. HW: Is the space still active when there isn’t a Folk School weekend going on? FA: There are other things that go on. We often get groups of kids from the county school system who have either behavioral or academic problems come up. We also get special groups who come up with a specific project in mind. One of these is our stained glass group who come together several times each year. Right now they are getting ready to put up a stained glass piece in the chapel at Camp Mikell. HW: I know the new facility at Camp Mikell is the St. Joseph the Carpenter Art Center, did you have a part in building that? FA: Yes, we built that. That’s when we decided that rather than haul stuff up there we wanted a permanent site. We raised the money for the building and the equipment to stock it. We got the lathes for wood turning, the looms for weaving, all of the stuff that we needed. I talked Camp Mikell into doing this and then we gave it to Camp Mikell. HW: And do you go to all of the Mikell Folk Schools each year? FA: I do.I don’t do it as much woodworking anymore but sometimes when I’m up at the camp I help the wood turners. I’ve also taught photography. I don’t think I’m as skilled at that. They probably need somebody who knows more than I do. But it is a very fun group. We don’t have an agenda except for people to come up and learn to do things. HW: Are the Folk School sessions a weekend long? FA: Each session lasts one weekend. We do some things that last longer, but these Folk Schools last a weekend. Some people say “well why can’t it go on for a week?” We get some really enthusiastic people. HW: What is the best way for people reading this article to contribute? FA: You can donate directly to the Mikell Conference Center and designate your contribution to go to the Folk School. Every now and then we send out a letter, but we don’t have a sustained way of raising funds. HW: Thank you very much for taking the time for this interview and it was wonderful to hear about these great organizations! To make a tax-deductible donation to the Mikell Folk School, please click HERE and designate that the donation should go to The Folk School. To make a tax-deductible donation to the Work of Our Hands, please visit the following link HERE.